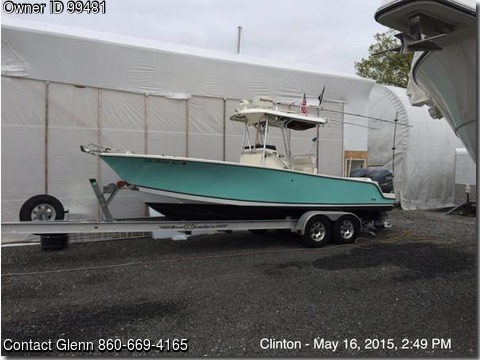 Boat is located in Clinton,Connecticut.Please contact the owner @ 203-494-8818 or glennboats@yahoo.com...Custom built center console,twin Yamaha F250's 360hrs. full electronics Raymarine E80's2,1000kw ducer, networked with auto pilot and serious weather. Raymarine A70D, Furuno loran cgps unit. Taco grand slam350's18'pole outriggers multiple rod holders , fish boxes. 12 underwater lights. Brand new Lewmar V700 windless w stainless steel roller , anchor , chain all polished. Marine head under console sitting on high gloss teak holly floor. Inside of console is finished off with upholstery steak that's varnished. Tubing tow pole. 2-lifeline 31 series gel batteries with moniter. 150gal fuel tank. Boat weighs about 5200 lbs is fast and fuel efficient the motor aren't working to hard the boat is fast and steady. Hull has a new AwlGrip paint with Pettit SR60 bottom paint. The boat is well thought out and raises fish plus makes the kids smile.